First thing you will notice with the Toshiba NB305 Netbook is the large comfortable keyboard. It’s a chiclet-style keyboard with the keys raised. By itself, this design is great because you don’t get as much dust or food particles dirtying up your keyboard. Next you’ll notice that the touchpad is huge. It is wider than most netbooks. The specs for the Toshiba NB305 are on par with other 10.1″ screen netbooks such as the Samsung GO N310 or Lenovo S10 Ideapad. 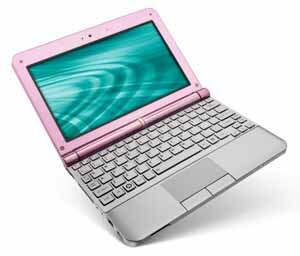 Specifically, the Toshiba NB305 netbook comes with Windows 7 Starter, 1GB RAM, 250 GB hard drive, webcam, and 10.1″ screen. Options can vary the actual netbook. The Toshiba NB305 can deliver up to 11 hours of battery life.